Spend the night in an art gallery! 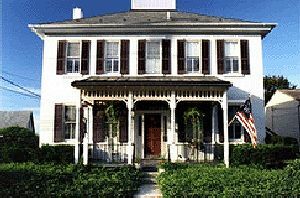 Our romantic bed and breakfast is located in the small town of Terre Hill in Lancaster County. Set among Amish farms, the horse-drawn buggies pass right by the inn. 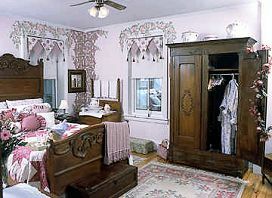 Decorated in antiques and the innkeeper's artwork, three rooms contain private baths, featherbeds, gas stoves, Amish quilts, hairdryers, CD players, robes, fresh flowers and include nightly turndown service. Four-course gourmet breakfasts each morning. Extensive gardens, Victorian porches, puzzle room with games, fireplace, and on-going jigsaw puzzle. Two suites feature jacuzzi tubs. Near antique shops, quilt stores, Amish attractions, Reading and Lancaster outlets, museums, golf, hiking, biking, cross-country skiing. Hershey, Gettysburg, Longwood Gardens, Winterthur, all about one hour away. We offer dinners with an Amish family, in-room massages, and gift baskets to make any occasion special. See our website for packages, availability, Bruce s artwork, and recipes. Romantic Country Inns, Getaways and B&Bs offer a great Pennsylvania lodging alternative to big hotels.